Ductility of reinforcing steel may be regarded as its ability to undergo plastic deformation. The test most commonly used to achieve a quantitative value for ductility is the tensile test. Historically, the product characteristic used to measure the extent of ductility was Elongation at Fracture, which can be considered as the total elongation exhibited by the steel. More recently, and primarily due to the work done to prepare product standards for use with the European design code for structural concrete, Eurocode 2, this has been changed such that product standards require the measurement of both Elongation at Maximum Load (Agt) and the ratio between the Ultimate Tensile Strength of the steel (Rm) and its Yield Strength (Re). 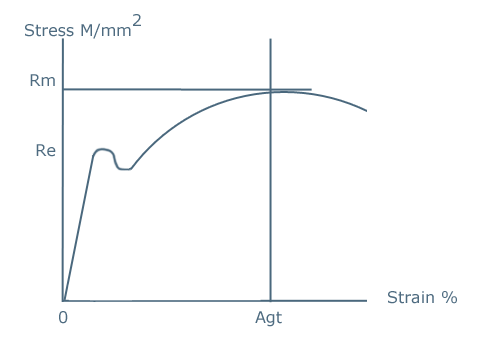 Agt, which is the percentage total elongation at maximum force, is that measure of elongation which excludes that considerable and highly localised extension of the steel under test in the area of plastic instability adjacent to the point of fracture. Agt is therefore considered as a more useful measure of ductility for use in design applications for concrete structures. The levels of performance of these product characteristics, as required by product standards, may be indicated by a classification of ductility attributed to the steel. This is referenced in BS4449 through the different grade designations B500A, B500B and B500C, with the latter having the more stringent requirements.